By the way, if you want to taste Kevin Zielinski's cider, head on down to Portland Nursery from 10a - 5 pm tomorrow and Fri-Sunday next week (Oct 18-20) to try some great local ciders. 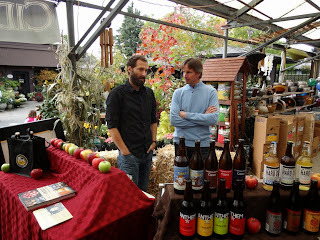 It's a buck a token and you can sample from EZ Orchards, Wandering Aengus/Anthem, Reverend Nat's, Finnegan, Finn River, Schilling, and Portland Cider. Kevin and his wife are pouring, so you can say hi to them, too.